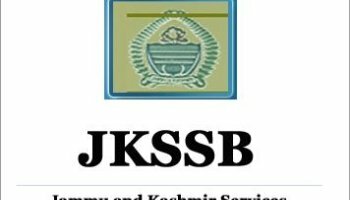 Jammu & Kashmir Services Selection Board (J & K SSB) published notification for recruiting eligible applicants to the posts of Junior Engineer (Civil), Junior Engineer (Mechanical), Draftsman (Civil), Draftsman (Mechanical), Junior Assistant, Junior engineer (Electrical), Draftsman (Electrical), Junior Stenographer, Technician -III, IEC Worker, Junior Stenographer, Motor Vehicle Inspector, Driver, Mechanic (SMG), Junior System Engineer, Assistant MVI, Sub MVI’s, Motor Vehicle Traffic Assistant, Labour Officer, Labour Inspector, Works Supervisor, Library Assistant, Junior Librarian, Multipurpose Worker & Village Level Worker. Applications are inviting for filling up the 1140 vacancies of these posts for various sub departments. Interested applicants can submit their applications from following online applications link. For online applicants applicants may need to pay the require amount of the applications fees as mention. Online applications will remain open til 22nd December 2017. Name Posts : Junior Engineer (Civil), Junior Engineer (Mechanical), Draftsman (Civil), Draftsman (Mechanical), Junior Assistant, Junior engineer (Electrical), Draftsman (Electrical), Junior Stenographer, Technician -III, IEC Worker, Junior Stenographer, Motor Vehicle Inspector, Driver, Mechanic (SMG), Junior System Engineer, Assistant MVI, Sub MVI’s, Motor Vehicle Traffic Assistant, Labour Officer, Labour Inspector, Works Supervisor, Library Assistant, Junior Librarian, Multipurpose Worker & Village Level Worker. Eligible applicants can apply to these posts by following online application link starts from 28th November 2017. For online applications applicants have to get register first which require to fill the details about the applicants as per requirement. To complete online applications applicants have to pay the require amount of applications fees as given.